Do you know what is the glass ceiling? And the impostor syndrome? 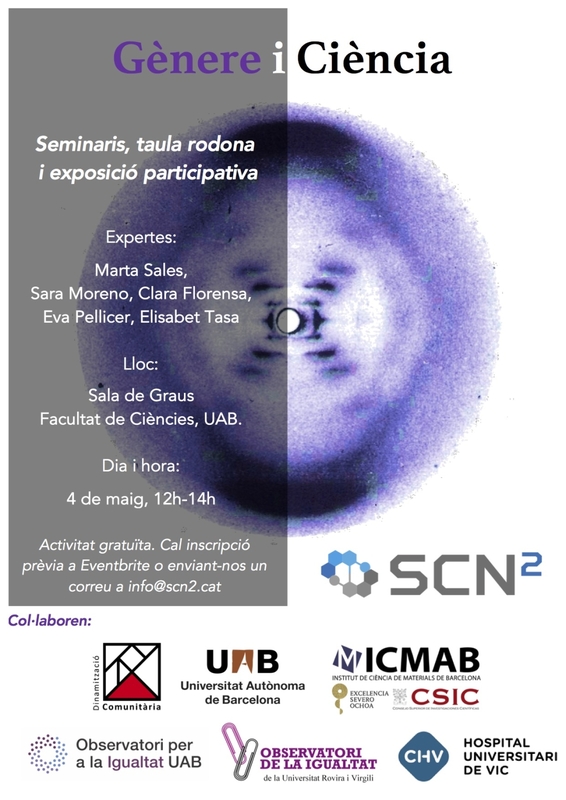 The Catalan Society of Nanoscience and Nanotechnology (SCN2), formed by students and researchers from the nanoworld, are organizing an event for May 4, 2018, about the gender situation in the scientific and academic fields. This event will include several talks and also an exhibition at the Faculty of Sciences, with a collage with a surprise effect! Great experts and researchers from three Catalan public universities will help us to understand the reality experienced by women in the professional field. They will be: Sara Moreno, Marta Sales, Eva Pellicer, Elisabet Rate and Clara Florensa. It is a free activity, but prior registration is required, reserving your place by sending an email to info@scn2.cat. ICMAB participates in the event collaborating in providing photos for the collage and its diffusion.